Filipinos are well-known for their youthful appearance and soft skin, even though they live in a climate that exposes them to the sun’s rays year round. Coconut oil is their main dietary oil, and is also the main ingredient in their skin care products. All of the Skin Care line that Tropical Traditions offers are made with organic Virgin Coconut Oil and Virgin Palm Oil. No other products on the market are made with finer oils as their base. Tropical Traditions Virgin Coconut Oil is traditionally made from fresh organic coconuts, and independent laboratory tests show that it has a higher level of antioxidants than other coconut oils. Unscented or with organic essential oils. In addition to using only the best oils available for the skin, all other ingredients used in Tropical Traditions Moisturizing Lotions are 100% natural. Our hand-made lotions contain no alcohols, no artificial fragrances, and no petroleum products. Because we recognize that many have sensitivities to fragrances, we offer an unscented version. For the varieties that are scented, we only use high quality organic essential oils imported from France which are distilled with low temperature and low pressure over an extended period of time. Low temperature and lower pressure have proven to be the most effective method of obtaining all of the essential constituents from the plant, and provide our products with the very best quality fragrances available. Excellent for massaging tired muscles. Ingredients: purified water, organic virgin coconut oil, organic jojoba, emulsifying wax (plant based, no soy), grapefruit seed extract, virgin palm oil, organic macerated arnica oil, and organic essential oils of wintergreen, peppermint, clove, helichrysum, and spruce. Our most popular scented variety! Ingredients: purified water, organic virgin coconut oil, organic jojoba, emulsifying wax (plant based, no soy), grapefruit seed extract, organic virgin palm oil, and organic essential oils of lavender, ylang ylang, geranium, roman chamomile, and rose. Ingredients: purified water, organic virgin coconut oil, organic jojoba, emulsifying wax (plant based, no soy), grapefruit seed extract, and virgin palm oil. Contains no essential oils for people with allergies or sensitivities to scents. Soothes the skin with its relaxing scent. Ingredients: purified water, organic virgin coconut oil, organic jojoba, emulsifying wax (plant based, no soy), grapefruit seed extract, virgin palm oil, and organic essential oil of lavender. Our coconut oil massage oils are a unique combination of oils and esters that are not processed with high heat or solvents that have been developed by a professional massage therapist. These oils provide superior glide yet work well for massage. They are made from our own Gold Label Virgin Coconut Oil and Virgin Palm Oil, and include organic macadamia nut oil or black cumin seed oil, and organic jojoba oil. No other products on the market are made with finer oils as their base. 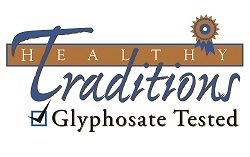 Tropical Traditions Gold Label Virgin Coconut Oil is traditionally made from fresh organic coconuts, and independent laboratory tests show that it has a higher level of antioxidants than other coconut oils. We only use high quality organic essential oils which are distilled with low temperature and low pressure over an extended period of time. Low temperature and lower pressure have proven to be the most effective method of obtaining all of the essential constituents from the plant, and provide our products with the very best quality fragrances available. These premium essential oils are imported directly from the manufacturer in France. Unscented Virgin Coconut Oil Massage Oil: 8 oz. Massage thoroughly into skin. Leaves your skin soft and silky without feeling greasy. Use as is or add your favorite essential oils to enhance your massage experience. Ingredients: Organic Virgin Coconut Oil, organic macadamia nut oil, organic jojoba, organic Virgin Palm Oil. Lavender Virgin Coconut Oil Massage Oil: 8 oz. Massage thoroughly into skin using slow strokes. Leaves your skin soft and silky without feeling greasy. For a relaxing bath, add one tablespoon to bath water. Ingredients: Organic Virgin Coconut Oil, organic macadamia nut oil, organic jojoba, organic Virgin Palm Oil, and organic essential oil of lavender. Arnica Virgin Coconut Oil Massage Oil: 8 oz. Contains a blend of essential oils for muscle massage. Ingredients: Organic Virgin Coconut Oil, organic macadamia nut oil, organic jojoba, organic Virgin Palm Oil, organic macerated arnica oil, organic essential oils of wintergreen, peppermint, clove, helichrysum and spruce. Mint Virgin Coconut Oil Massage Oil: 8 oz. Massage thoroughly into skin using vigorous strokes to enhance the effects of the essential oils. Leaves your skin soft and silky without feeling greasy. For an invigorating bath, add one tablespoon to bath water. Ingredients: Organic Virgin Coconut Oil, organic macadamia nut oil, organic jojoba, organic Virgin Palm Oil, and organic essential oils of peppermint and rosemary. People living in the tropics where coconuts grow have used coconut oil to clean their teeth long before modern toothpastes were developed. Tropical Traditions has developed a new Teeth Cleaner based on our popular Organic Virgin Coconut Oil as the main ingredient. This 100% natural cleaner for your teeth contains no fluoride and no foaming agents such as SLS. Along with Organic Virgin Coconut Oil, we have added other natural ingredients to clean your teeth naturally. This unique Teeth Cleaner will keep your mouth and breath feeling clean and fresh naturally, with only the finest ingredients available used. Invest in your teeth today by buying the best cleaner available! Note: We only use high quality organic essential oils which are distilled with low temperature and low pressure over an extended period of time. Low temperature and lower pressure have proven to be the most effective method of obtaining all of the essential constituents from the plant, and provide our products with the very best quality fragrances available. Ingredients: purified water, organic virgin coconut oil, baking soda, xanthum gum, wildcrafted myrrh powder, stevia, and organic essential oils of peppermint, spearmint, cinnamon, and clove. Ingredients: purified water, organic virgin coconut oil, baking soda, xanthum gum, wildcrafted myrrh powder, stevia, and organic essential oils of peppermint and spearmint. The Shampoo Bar is also made from our organic Virgin Coconut Oil and contains natural patchouli. Handmade in the Philippines. Pure and natural for sensitive skin. Created for those with allergies or are sensitive to fragrances. Ingredients: organic virgin coconut oil, organic beeswax, and organic virgin palm oil. Robust, traditional essential oil. Ingredients: organic virgin coconut oil, organic beeswax, organic virgin palm oil, and organic essential oil of tea tree. Subtle vanilla flavor. Ingredients: organic virgin coconut oil, organic beeswax, organic virgin palm oil, and organic vanilla extract in coconut oil. Refreshing taste of tangerine, orange and lemon. Ingredients: organic virgin coconut oil, organic beeswax, organic virgin palm oil, and organic essential oils of orange, lemon, and tangerine. Spicy and refreshing. Ingredients: organic virgin coconut oil, organic beeswax, organic virgin palm oil, and organic essential oils of orange and cinnamon. Spicy and cooling. Ingredients: organic virgin coconut oil, organic beeswax, organic virgin palm oil, and organic essential oils of peppermint and cinnamon. Liquid Hand Soaps: Foaming 8 oz. Most liquid soaps you find have added ingredients to make them thicker in consistency. 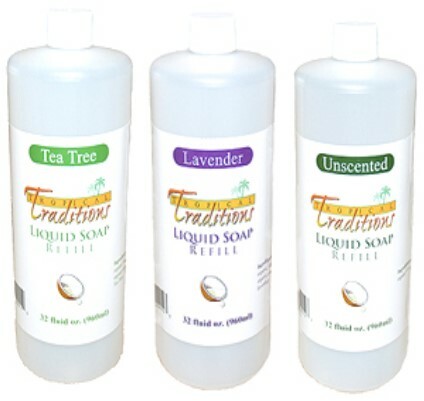 Tropical Traditions Natural Liquid Soaps are made from 100% organic Virgin Coconut Oil, and nothing else. The scented varieties have organic essential oils added. These are packaged in a special foam pump dispenser that adds air to the soap, causing a rich lather of foam to come out. Description: The unscented soaps are made from our organic Virgin Coconut Oil. They produce a very rich lather. Oil. They produce a very rich lather and are scented with organic essential oils. Coconut Soap Tea Tree: saponified organic virgin coconut oil, and organic essential oils of tea tree and lemon. Unscented Moisturizing Cream: 4 oz. ea. Ingredients: purified water, organic virgin coconut oil, emulsifying wax (plant based, no soy), palm stearic, grapefruit seed extract, organic beeswax, and organic virgin palm oil. Contains no essential oils for people with allergies or sensitivities to scents. Baby Silk Moisturizing Cream: 4 oz. ea. Beneficial overnight cream. Ingredients: purified water, organic virgin coconut oil, emulsifying wax (plant based, no soy), palm stearic, grapefruit seed extract, organic beeswax, organic virgin palm oil, and organic essential oils of lavender, ylang ylang, geranium, roman chamomile, and rose . Arnica Moisturizing Cream: 4 oz. ea. Contains a blend of essential oils for muscle massage. Ingredients: purified water, organic virgin coconut oil, emulsifying wax (plant based, no soy), palm stearic, grapefruit seed extract, organic beeswax, organic virgin palm oil, organic macerated arnica oil, and organic essential oils of wintergreen, peppermint, clove, helichrysum, and spruce. 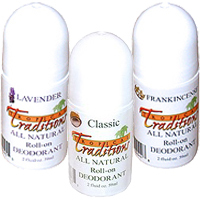 Tropical Traditions Coconut Oil Deodorants are chemical-free, paraben-free, and aluminum-free deodorant roll-ons made from our popular organic Gold Label Virgin Coconut Oil as their base. Your underarms are one of the most sensitive and absorbent areas of your body, so don’t put harmful chemicals into your body through antiperspirants or harmful deodorants! Classic: purified water, organic Gold Label Virgin Coconut Oil, organic jojoba, plant based emulsifying wax, grapefruit seed extract, sodium bicarbonate (baking soda), organic essential oils of cedarwood, geranium, tea tree and patchouli. Lavender: purified water, organic Gold Label Virgin Coconut Oil, organic jojoba, plant based emulsifying wax, grapefruit seed extract, sodium bicarbonate (baking soda), and organic essential oils of lavender, lemon, and rosemary. Frankincense: purified water, organic Gold Label Virgin Coconut Oil, organic jojoba, plant based emulsifying wax, grapefruit seed extract, sodium bicarbonate (baking soda), and essential oils of wildcrafted frankincense and sandalwood. Note: We only use high quality organic essential oils which are distilled with low temperature and low pressure over an extended period of time. Low temperature and lower pressure have proven to be the most effective method of obtaining all of the essential constituents from the plant, and provide our products with the very best quality fragrances available. Imported from France.